If you own multiple properties or rent several units, keeping up with all of your tenants can be difficult. Are you struggling to stay on top of property management? 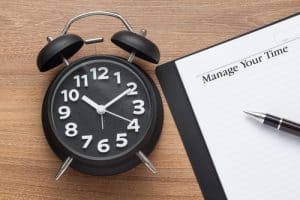 Let our time management tips and tricks help you increase efficiency and responsiveness while decreasing stress. Draw up a list of what needs to be done. Before you get organized, write a list of what needs to be completed at all properties. It can feel overwhelming to list everything, but you’ll soon use your master list to get organized. Group like with like: For example, if you realize that three units need electrical work done, it makes sense to bring in an electrician to complete the work once rather than make three separate appointments. By scheduling all the work at once, you can save money and time. Use a calendar. Now that you have a thorough understanding of what needs to be done, put tasks on your calendar. Tackle time-sensitive items first, then schedule minor or ongoing tasks. Allocate one day each week or month for items that repeat, such as landscaping properties or holding an open house. Once duties are scheduled across the month, you’ll find it easier to accommodate landlord duties in your daily life. In general, people are most productive in the morning. Spend your morning completing the tasks you need to do, then spend the afternoon visiting properties or handling on-site repairs. Use automated tools to make managing tasks easier. Some tasks can be set up once, then automated on whatever schedule makes sense. Take social media, for example. If Twitter and Facebook are important to your property management marketing, spend an hour coming up with social media posts. Then, schedule these posts using an automation tool and enjoy regular marketing without the effort. Automation also saves time by curbing distraction. It’s too easy to get distracted on social media. You may visit Twitter to post a quick tweet about your upcoming open house, only to find yourself scrolling through celebrity posts for 20 minutes. Outsource what you don’t want to do. Property management tips often suggest building a team for good reason. It’s helpful to have others who can assist you in keeping properties looking their best. If you’ve been trying to run your properties alone, it might be time to hire an assistant or outsource the tasks that you do not want to do. Consider hiring a landscaping firm to maintain curb appeal or retaining a handyman who can quickly make minor repairs at your properties. There are many benefits to increasing your efficiency and reliability. When you aren’t having to market properties, your to-do list will decrease, and so will stress. Staying organized helps you remain responsive when tenants need something, which increases their satisfaction. If tenants see you as reliable and proactive, they will be more likely to renew their lease. Even if getting organized decreases your workload in the long run, it can feel overwhelming to change the way you manage rentals, especially if you’ve employed the same landlord routines for several years. Implement these tips for property managers one by one to find success.